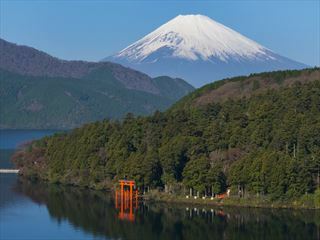 Journey to the ever fascinating and welcoming land of Japan on this 12-night small group escorted tour to learn about their ancient cultures, austere traditions and witness the ground-breaking technologies. This diverse country has lots on offer, from the excitingly lively city of Tokyo to the cultural heart of Kyoto. Passing through the sacred shrines of Nikko, tasting local delicacies at the Takayama market, exploring the Hiroshima Peace Park and enjoying the elaborate Kyoto temples. Uncover ancient castles, stunning countryside’s and absorb the fascinating feudal history on this Land of the Rising Sun authentic journey through Japan (INT - CJST). Please note: the minimum age for this group tour is 15 years. Experience the outdoor onsen (hot springs) in the town of Hakone, you may be able to glimpse Mt Fuji from here on a clear day. Zip from place to place on the ultra-modern and efficient railway system. 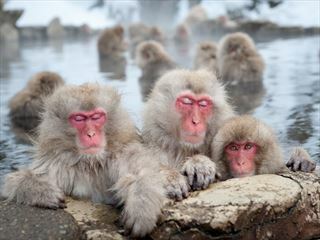 Explore the local markets, Hida Folk Village and stop by a sake brewery if you fancy. 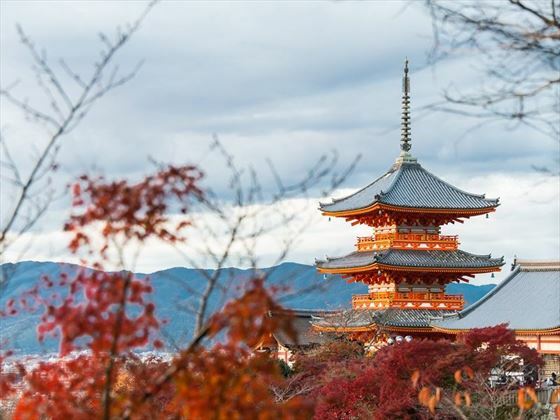 Spend two days in the cultural capital Kyoto, home to wonderful temples, tea houses and frozen in time Zen gardens. Konnichiwa! 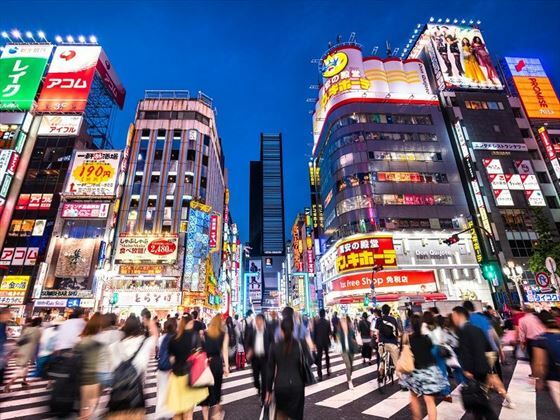 Welcome to Japan, there are varying sides of Tokyo to discover, from captivating museums to world class shopping, neighbourhood backstreets with many restaurants and bars. Tonight attend your welcome meeting at 6pm then enjoy some free time to explore the lively city. 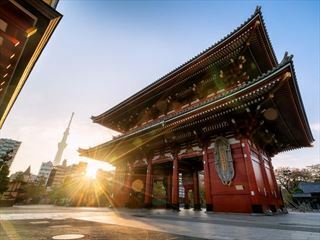 This morning enjoy a couple of hours to explore your surroundings, perhaps head to what is known as the Temple District in the Asakusa area. After a relaxing morning jump on the express train for an hour then onto the local train for an hour towards Nikko – enjoy the beautiful countryside views while you snack on bento boxes, green tea and beer. Upon arrival enjoy some free time. Spend the day exploring this sacred city and take a visit to the Toshogu Shrine. 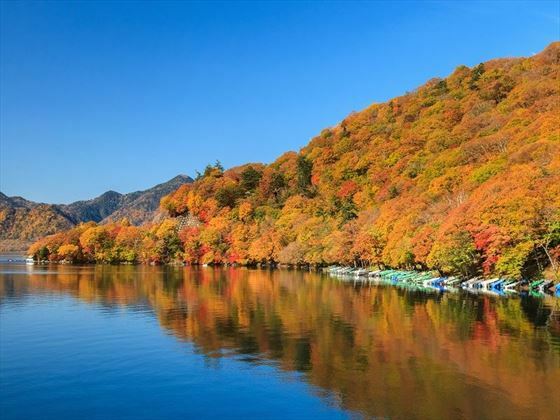 You then have the option to hop on a bus to the Chuzanji Lake or visit the Imperial Villa. Some of the famous landmarks here include the red-lacquered Shin-kyo Bridge and the Buddhist temple of Rinno-ji, definitely worth a visit. Board a local train, followed by two bullet trains and a bus today on your way to Hakone, arriving by mid-afternoon (depending on connection times). 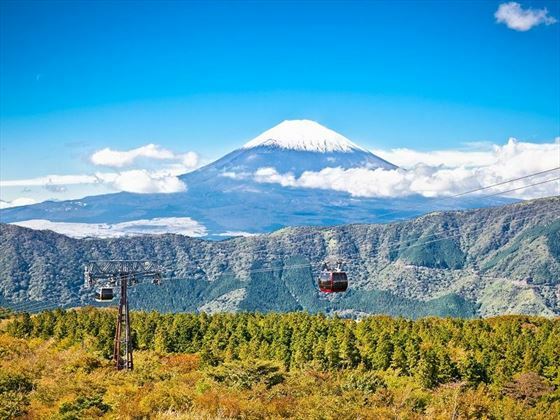 Once you are in Hakone ride a boat across the Ashinoko Lake and take the cable car up into the mountains enjoying the breathtaking views – you may even see the wonderful Mt Fuji in the distance if the weather is clear. Tonight reside in a family run guesthouse with shared facilities and a lovely outdoor onsen. Men and women here enter separate baths and neither clothing nor swimming costumes are allowed. Take the shinkansen (bullet train) today reaching speeds up to 270km/ph – you’ll arrive in 4 hours to the charming Edo period town of Takayama in the Japanese alps. First stop will be is the outdoor museum where you can discover the techniques used to build old farmhouses which would withstand the fierce winters and long periods of isolation, this has been recreated in the mountain setting for you to explore and wander round the art galleries, local markets and museums in this delightful little town. Take a trip to the morning markets which are over 600 years old – browse through the seasonal vegetables, preserved fish, spices and delicious marshmallow treat of Owara Tamaten. Spend the rest of the day at leisure – why not visit one of the local breweries and try your hand at creating sake, the climate here is perfect for it. 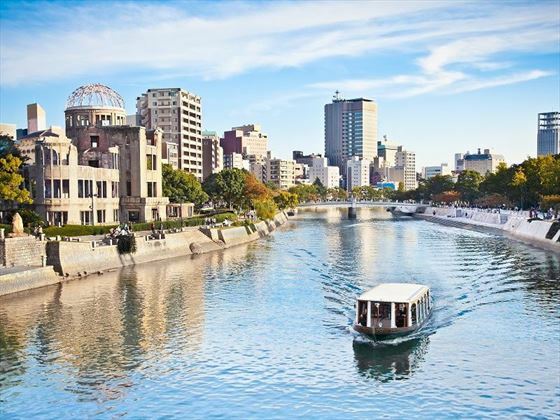 Ride the train for 5 hours to Hiroshima for a visit to the Genbaku (A-bomb) dome and peace memorial park and museum, both of these stand emotionally as testament to the fateful day in 1945 when Hiroshima was targeted as the first ever use of the atomic bomb. The dome stands metres from where the bomb was detonated and managed to retain its shape – serving as a reminder for the peace along with the memorials and monuments dedicated in memory of the victims and educating on what lead to the use of this weapon. Enjoy free time to explore the extensive exhibitions or alternatively, head over to the enchanting island of Miyajima – at high tide this is considered as one of the most stunning spots in Japan. Here you can walk around the Monmaji Park or ride the cable car up to Mt. Misen, look out for the deer which roam the streets. Sample a local dish this evening – okonomiyaki, a type of savoury pancake made from egg, cabbage, soba noodles and meat or seafood. Day 10 you have time to visit the Chuo Park and the magnificent Hiroshima Castle dating back to the 1590’s, although destroyed by the bomb the reconstruction hosts an informative museum. After sightseeing why not relax in the serene Shukkeien gardens, winding through the bridges, tea houses and waterfalls, it’s a magical place. Baseball and soccer teams here can also be fun to see – the choices are endless. 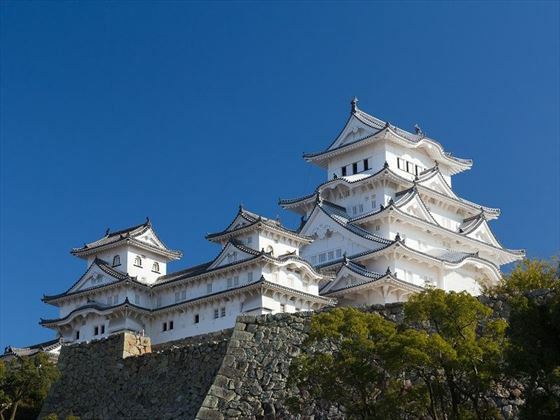 Head over to the Samurai Castle at Himeji today – explore the fascinating building with its towers, moats, baileys and walled alleyways aimed to trick attackers, perhaps so effective no one dared test it! Climb to the seventh floor and discover what was once home to over 10,000 samurai families! This afternoon continue one hour by train to the once capital city of Japan for over 1,000 years – Kyoto. Explore its historical streets and lively nightlife – visit the izakayas, live music venues or theatres. Today enjoy a visit to some of the best temples in town suggested by the your tour leader and enjoy leisure time this afternoon to wander the eastern hills along the ‘Path of Philosophy’ linking two temples together and continue down to the wooded gorge. Those visiting in spring, a visit to the theatre for a Miyako Odori Blossom Dance by elaborately dressed maiko is a good option, or a visit to the extravagantly decorated Kinkakuji temple, immortalised in Yukio Mishima’s novel “The Golden Pavilion”. Another great stop is the architecturally impressive Higashi Honganji temple and almost surreal Sanjusangendo, home to 1,001 statues of Kannon. Perhaps head out this evening to Gion, the famous Geisha district. Even today you can observe the age-old tradition of geisha girls visiting members of the wealthy elite. This unfolds in small teahouses tucked away in tiny back streets. Check out from your hotel is 12noon, luggage can be stored if you depart any later. Toshogu shrine, Lake Ashino-Ko boat trip, Cable car in Hakone, Market visit in Takayama, the Himeji Castle in Himeji and two temple/ shrine entrances in Kyoto. Daily breakfasts are no longer included in this tour due to the traditional Japanese breakfast foods not being up everyone’s street so you may choose to pay separately for your breakfast daily or stop off at a convenience store/ bakery/ coffee shop in the mornings. Amazing savings Book your holiday by 3 May 19 and receive up to $590 discount. Travel before 15 Dec 19.